It is not without some little trepidation that I post this short essay to the internet. Doubtless I will be sandwiched between disparaging dismissal that this thesis is a baseless fantasy on my part, or else that it is already a commonplace which all who truly know Tolkien or anything about his sojourn in Leeds have known since before the ark. I claim to be no special Tolkien scholar and I have not read even a tithe of his posthumously published work, but I have lived in or near Headingley for close to four decades and have developed a close feeling for the place. When my own interest in reading his works grew earlier this year I found myself thinking more and more about how he would have experienced the village suburb and began to try to imagine it through his eyes, through his imagination. This may be a commonplace thesis which others have reached before me. If so, then I concede to them their prior discovery. But I have done several internet searches, and the dominant result for ‘Tolkien and Headingley’ brings me to the blue plaque recently placed on the house in West Park in which he lived for the last two years of his stay here, and no further. What you are about to read here, is at least to me, the first time that this interpretation of his stay in the area has been stated. It is unpolished as I have been exploring this and writing it down as it has come to me, but it seems to be such a secret in plain sight and so obvious an interpretation that it might just fall out into anyone’s mind who gave it half a moment’s thought, and so I put it out there with no further delay. This is evolving in my mind all the time and there will be more to come on this, some of which I already have in my mind. A long time ago I heard that Tolkien had lived in Leeds, near Woodhouse Ridge and that some of the local features had inspired locations in his work. As a long term resident of Headingley, and reader of Tolkien since childhood, this intrigued me. I instantly thought of one area that jumped out at me, but that was as far as it went at the time. This was Woodhouse Ridge, which has always reminded me of Ithilien, for its beautiful wooded slopes and pathway along its side. Another detail I shall come back to seems to be in just the right place and is wonderfully characteristic. Last year I reread The Hobbit for the umpteenth time, and started The Book of Lost Tales, but it was rather hard work, and I decided that I needed to read The Silmarillion again before I attempted it. Something that had intrigued me however, was Tolkien’s use of the idea of the ancient city of Kôr which curiously I had just read about in H. Rider Haggard’s ‘She’. This was one of the most successful books of the late nineteenth century, and it was inconceivable that Tolkien had not been aware of it, or that he had not read it. Whilst there is no counterpart of Kôr in Leeds to my knowledge! it did show me how he would take influences and use them in his work. It is also the name of the bed of Hel, the Norse goddess of the underworld and death, but this seems more of an influence on Haggard’s than Tolkien’s Kôr. So I put the Lost Tales to one side, and read lots of CS Lewis last year. Exhausting my available resources in that department, at the beginning of this year I came back to Tolkien, not least due to the influence of Malcolm Guite, chaplain of Girton College, Cambridge, who had published some superb podcasts on the Inklings and their importance to the modern world of eco spirituality, amongst other things. I could put off rereading The Lord of the Rings no longer, for perhaps the dozenth time or so, but it was over a decade since the last so it didn’t feel self indulgent. I’m a bit of a Jenny come lately to Tolkien and Headingley ~ I didn’t hear about the plaque on his old house in Darnley Road, West Park until some while after it had gone up. I may have been a lifelong reader of Tolkien, but it is a very recent development that I have got into the animistic side of MiddleEarth, which combines both the ethical and eco spiritual sides. My own interest in the mythic landscape of the local area has taken a life of its own over the last year or so and with the focus on protecting Headingley from a destructive bypass for an inefficient trolleybus scheme that has developed since, I have begun to think about what Tolkien would feel about trees that he knew on his daily journey to the University being cut down. The next thing of course is to think of stories where trees are cut down; first to mind was CS Lewis’s The Last Battle where the Calormenes are cutting down Lantern Waste which has great meaning for me, but in Tolkien’s work it is the trees of Fangorn Forest which were being cut. A few weeks before I had observed to a friend that the Councillors who are hell bent on destroying the most beautiful part of Headingley had minds of metal and wheels, just like Saruman who saw everything in terms of how he could use it and didn’t respect it for its own intrinsic worth and beauty. I began to think of Tolkien within this very landscape ninety years ago, and what it must have been like then. His own vision of the land with its mythopoeic resonances led me to the defining seed of Headingley, the Shire Oak, which was still standing in his time. A photograph a friend found on the web of the Oak has strengthened my intuition that this is the seminal Treebeard. Just as Treebeard is the chief of all the trees in MiddleEarth, so the Shire Oak is the chief of all trees in the Shire of which it is the centre. And so here we have the other core feature of Headingley which I believe was an influence on his ideas, the Shire. It is inconceivable to me that his creation of the Shire as the starting point and foundation on which the Hobbit is written would have no reference in it to the Shire [Oak] that he had known a decade and more earlier. Tolkien was, in the eyes of some, a terrible plagiarist. All the names of the Dwarves in The Hobbit are taken from Norse myths, and many of the themes in his grand mythology were modelled on the archetypal characters and dynamics of the same. King Theoden has strong resonances of Beowulf. He openly acknowledged all this, but did not consider it plagiarism, simply a modern reworking of ancient and universal themes. In Jungian terms, the dynamics of the archetypes of the collective unconscious. It is harder to imagine that Tolkien would not be influenced by such numinous beings as the Shire Oak and its ancient cultural context than to suggest that he drew on such things in his work. Having delved into his mind and grasped his bardic vision, one can walk more fully in his world. All his life Tolkien saw through into a mythic level of reality where dragons flew and trees walked and talked. What more likely vision could there be for him than the massive and ancient Shire Oak as some anthropomorphic creature, which it did actually look like from the photograph. So here we have an ancient landmark dating to the Anglo Saxon period ~ Tolkien’s particular special subject, being Professor of Anglo Saxon ~ which it must be inconceivable that he did not take a great interest in, and its name is the same as the name of the home of his heroes in the Hobbit and Lord of the Rings. Besides which, Tolkien himself is largely a mix between a Hobbit and an Ent, if you set aside his elvishness. Going deeper, one must realise that Headingley in the early 1920s was a village like suburb that was quite rural, intermingled on the outskirts up to Beckett Park with farmland. Even now there are still stables nearby in the Meanwood Valley. Headingley on the Hill, a sleepy rural suburb away from the busy city, where people liked to mind their own business and be left alone, with a Shire Oak, rather like Hobbiton on the Hill where people like to mind their own business and be left alone in their Shire with a large Party Tree. Conjecture ~ perhaps. Speculation ~ maybe. I have seen no documentation that Tolkien made any deliberate or specific literary allusion to these features or that they may have had some imaginative influence on his landscapes and settings. However there are other parallels in his life. It is well known that the Warwickshire of his childhood was his model for Kortirion in The Book of Lost Tales, a posthumously published compilation of early work edited by his son Christopher. His wartime experiences in the Battle of the Somme influenced his work deeply over many years from stories in the Silmarillion to Frodo’s visions of long perished warriors in the Dead Marshes. How much would the gentle world of Headingley in the 1920s be valued by Tolkien after the horror of the trenches? Hobbiton and the Shire have in literary criticism been compared to wish fulfilment fantasies, almost a return to the security of childhood. A secure place in the mind to go to escape the post traumatic stress inflicted by the Somme. Headingley, still perhaps retained a ghost of the Edwardian Belle Epoque. My mother has told me that after the Second War everyone used to talk about ‘getting back to how it used to be before the War’. How so this must also have been the desire following the Armistice. After a short sojourn at Oxford working on the Dictionary his appointment at Leeds University must have been valued as also giving him the opportunity to escape to a place where the past still lingered. The sleepy suburb of Headingley with its Anglo-Saxon roots and ancient trees must have been a much appreciated discovery for him. It has been noted on many occasions his special feeling toward trees, which comes out again and again in his literary works. His arrival in a location where a truly ancient tree already revered by the Anglo-Saxons was still extant must have seemed serendipitous to him and cannot have failed to arouse his imagination. Not that he moved immediately to Headingley. His first residence was apparently near the University on St Mark’s Terrace, now demolished. But that was near Woodhouse Ridge, which bears a strong resemblance to the land of Ithilien in The Two Towers. A feature which strikes me as strengthening this link is the ginnel, a narrow stone passageway, which cuts up from the steepest part of the Ridge and over the top to the other side. Overlooking this is an ornate building with an oriel window that looks somewhat like a tower. The Pass of Cirith Ungol with its Tower guarding it. To Tolkien old Woodhouse nearby might well have seemed like Mordor. The mythic dream landscape mixes up images from daily life and reinterprets them creating a gestalt of new meaning, allowing expression of deeper archetypal feelings. The half decade of stability that Tolkien and Edith knew at Leeds after the turbulence of the war must have been of value for a greatly needed time of healing. Much has often be made of the parallels between Frodo’s wound and his inability to find peace of mind back in the Shire despite trying, and Tolkien’s own psychic wounds from the Western Front. Headingley may not have given him all the healing he needed, perhaps he would never find that, but like the Shire it was somewhere he was willing to give it a try, and perhaps that is why its resonance breaks through with some of the most innocent and benign aspects of MiddleEarth, while even the memory of Mordor still lurks over the hill, at the end of the pass, a memory which may not fully manifest itself, but which stalks like a Ringwraith. What more comforting security than the Shire, but not just the Shire, but the Shire with Treebeard at its centre. There are other possibilities for seed ideas between Headingley and the Shire, but these are at the core. Treebeard, the Shire and the Shire Oak. And their importance to the evolving symbolic expressions of Tolkien’s deepest archetypal feeling. Perhaps one can go so far with this that one is simply seeing the projection of one’s own desire to see the world of MiddleEarth around one. But given the known historical relation of Tolkien to this place, with its own Anglo-Saxon history which must have been of interest to perhaps the greatest Anglo-Saxon scholar of the twentieth century, it would be entirely lacking in imagination to refuse to see the potential for inspiration presented to him. And imagination is one thing old Tollers had in abundance. Many thanks and much gratitude to Bill McKinnon for his correlation of the Shire of MiddleEarth with the Shire Oak of Headingley when I told him of my Treebeard correlation. Many thanks to Malcolm Guite for his private comments on this piece. He has has drawn my attention to two points which need clarification. 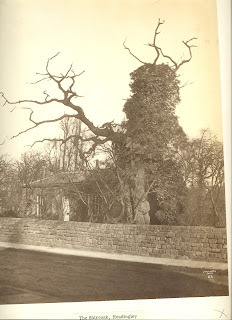 Firstly, that the Shire Oak was still standing in the 1920s. I understand the photo above was taken in about 1890, Tolkien was in Leeds from 1920 to 1925, and the Oak fell on the 26th May 1941, so he will have known it. Secondly, I should say that in no way do I consider Tolkien to have been a plagiarist. That is just a view some people have who don't really understand the grand themes and context of his work. Someone I was speaking to about his work the other night suggested this, which is largely why I included the comment, but it is a view which I do not share. As Malcolm has said, drawing on Tolkien's own writing on the subject, 'what he is doing is rooting himself and branching from what he called 'the tree of tales' ~ that approach is all laid out in his essay on fairy stories.' Indeed and absolutely. I am very interested in your insights. When I first moved to Leeds in 1973 from London I lived on Headingley Hill - and was already a deep Tolkien fan - as was my husband and as we walked over the Ridge to Meanwood we could hardly believe the resonances with LotR. The very name Meanwood - a haunted Rivendale. With its medieval stone bridges; trees growing out of rocks, round rocks embracing many shapes. We certainly felt we were among ents. And were very happy. We lived in Chapel Allerton for a few years with weekly walks over to the Ridge to have fish and chips in Bretts. In 1976 we moved to Headingley. And now I find our house was but over the road from one of Tolkiens lodgings on 25 St Michael's Road. For the millennium I did some history of Headingley though it never got published but furnished me with lots of interesting stuff. And the most interesting was round the shining oak (skyrack)it seemed a very magical place to me. And although I have never been into ley lines particularly - I think when you get a place which has the tree of such significance - a war memorial a church old chapels all within spitting distance you know you are you are in a special place. There is some energy there. And as I watch the crowds drawn to this spot - whether as it used to be on the pavements outside the Skyrack - tumbling on the the war memorial - or the queues that form to go in the Original Oak. I think that people are drawn by a natural force and then go to the nearest pub. It was the first stopping place for the stage coaches. And it therefore got and retained Number 1. I am deeply upset by the cavalier plans to make clumsy greedy ill thought changes to this beautiful road. I'm going to post this before I think better of it - I just want you to know. Tolkien could not have failed to be impressed by the Shire Oak still lording it a few steps from his lodging on the main thoroughfare. It was said it was an acorn in Roman times. What a life for a tree. How special. You might look in the Special Collections at the Brotherton. They inherited the brilliant library of Lord Brotherton before he died in 1930. Full of wonderful things and worth a look. Thankyou very much for your kind words of encouragement. I do very much agree with your thoughts about people being attracted to special places such as this. I have been thinking about Meanwood too, apparently it means 'Pillared Wood' so that is something to explore further. And it is a wonderfully magical wood. Fortunately I am a graduate of the University and a few years ago I took advantage of my graduate's library ticket to go into the Brotherton special collections so I am familiar with it and will be doing so for this as soon as I get the time. There are bound to be some references which have never been noticed before. Time for Headingley to take its place in the rich pool of influences from which MiddleEarth grew!